Since the first PadMaps in the year 2000 until today, the World of Padman has been widely and also internationally reported in the media. We have taken the trouble to compile an overview of the to us known essential articles, reports and mentions in chronological order. Of course, this list is not complete, so we are happy when we are alerted to missing contributions. Also, for copyright reasons, we can not put all posts online for viewing as we explicitly require the permission of the copyright holders. But we have already contacted many publishers and editors and ask you for a little patience. In the meantime, we hope you enjoy browsing and discovering! 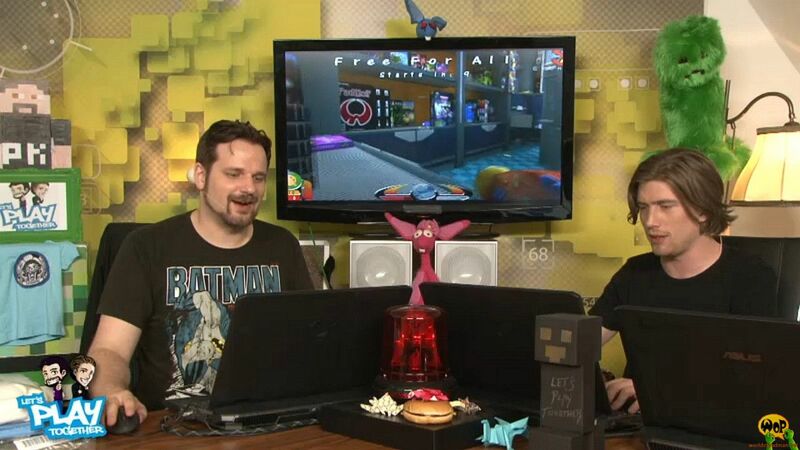 Barely a year after the release of the 1.6 patch, Gronkh and Sarazar presented World of Padman in the 20th live stream of Let’s Play Together. The game modes Free For All and Spray Your Color were played on the maps PadShop and Backyard. It took a while for them to understand how Spray Your Color works. A recording of the stream is available on YouTube. A very detailed interview from ~The Happy Friar with Kai-Li about the recently released 1.6 patch for World of Padman. It’s about the team behind it, the difficulties in trying to commercialize the game and, of course the version 1.6. 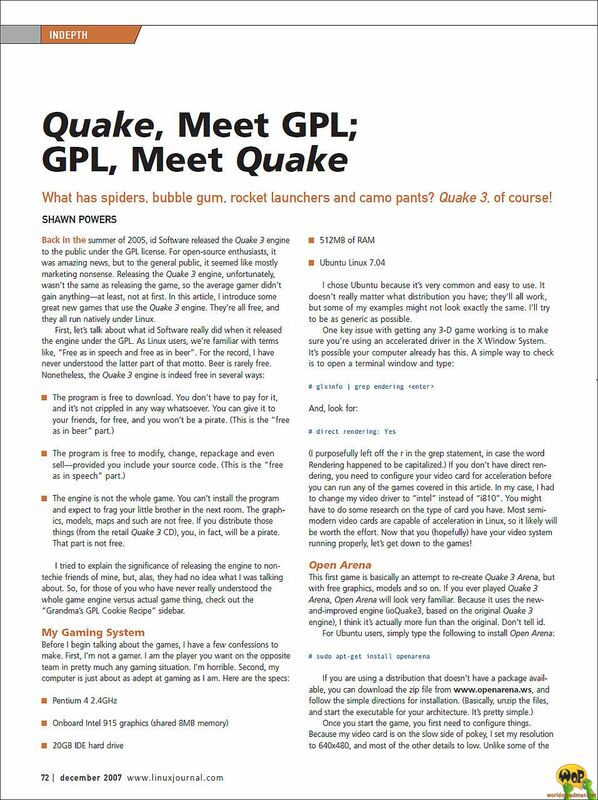 The interview is directly accessible via planetquake.gamespy.com (at that time planetquake.com). 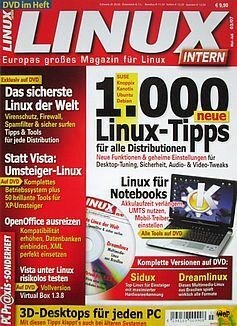 In this issue, a two-page article was actually about the Linux distribution Game Drift Linux, which was almost a first App Store for Linux games. World of Padman was one of them and was featured in the article coincidentally in a screenshot of the game store. Thus WoP had also made it into the issue of this magazine. Unfortunately we can not offer the article here, because we do not have any permission yet. 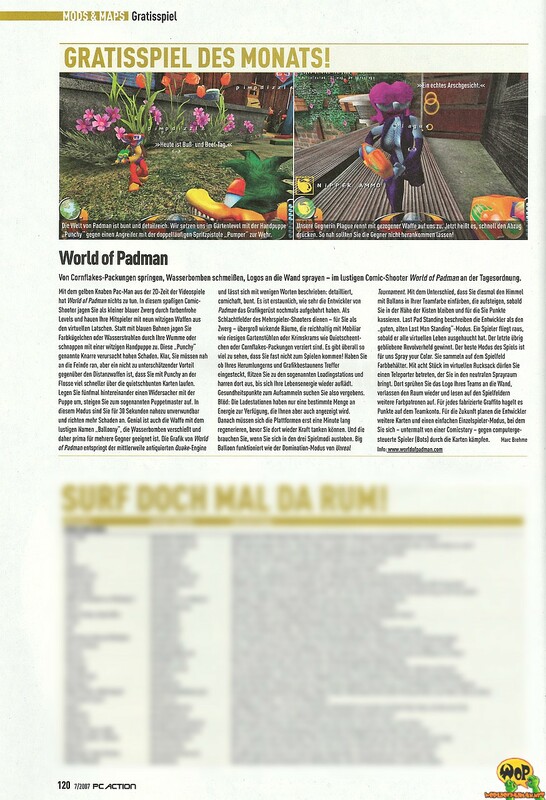 Immediately after the release of World of Padman 1.6, doelf from au-ja.de reported on the new version and bug fixes. The article is directly accessible via the news archive on au-ja.de. In this XL issue, there was World of Padman on the DVD and was considered in the section Free Play with a nice little article. You can find the article here. Courtesy of the editorial board of GameStar. 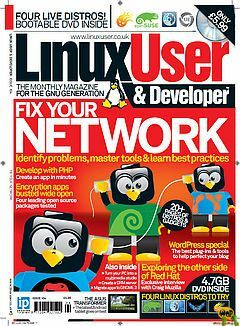 This issue of the Indian Linux For You magazine included the live DVD “Live Linux Gamers” version 0.9.5, which also included World of Padman next to other games. Many of the games were briefly presented in a multi-page article. Unfortunately there was no space for World of Padman, so it is only listed by name in the game list. 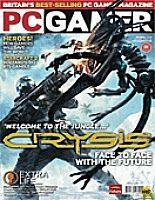 World of Padman was featured in this issue of PC Games Hardware on DVD and was only mentioned on the DVD cover and on the front page, after all! You can find the cover here. Courtesy of the COMPUTEC MEDIA GmbH. 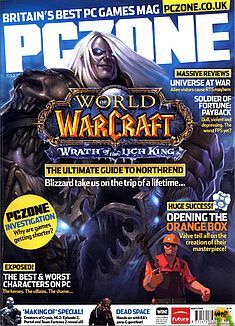 It took a whole three months since the release, until the 1.2er patch for World of Padman made it on the DVD of this issue. 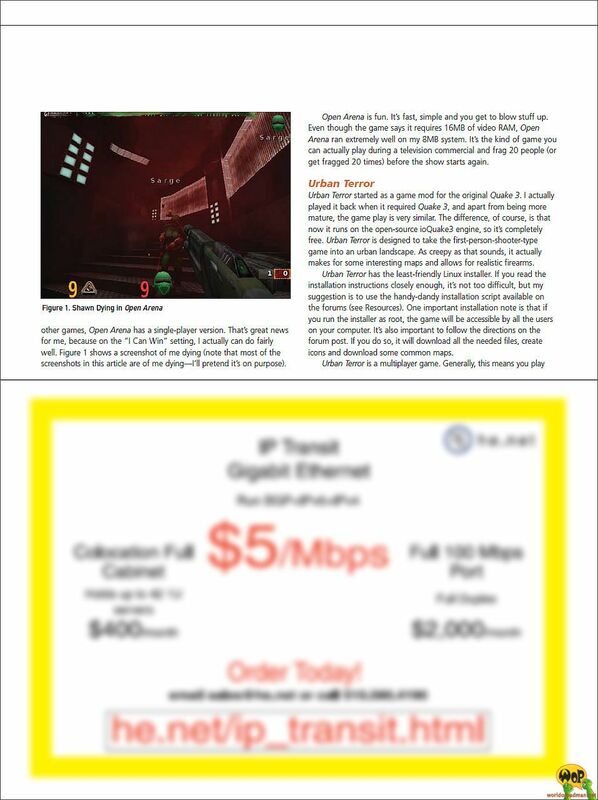 In the magazine itself, there was a small but very colorful reference to this Bug-Fix of the Month in the section Freeplay News. 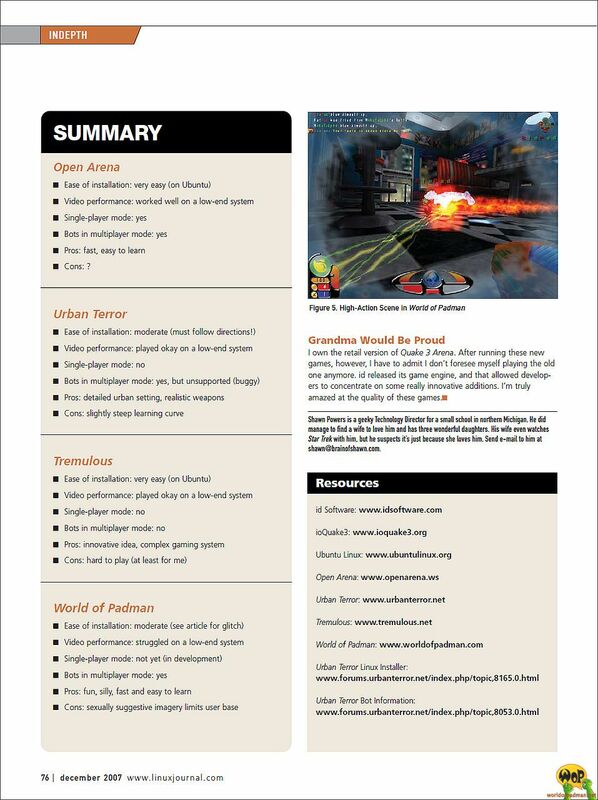 In this very detailed and multi-page article by Shawn Powers, World of Padman is featured as one of several games based on the Quake3 engine. Particularly interesting here is the description of the installation process under Linux. Despite the criticism of the slightly too provocative portrayal of the ladies in the game, the overall conclusion is very positive. The complete article includes page 72, page 73, page 74, page 75 and page 76. 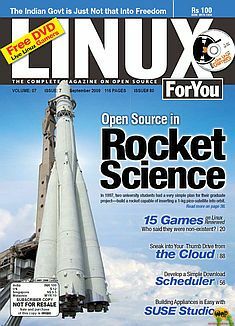 Courtesy of the editors of the Linux Journal. A detailed article about World of Padman, the inventor ENTE and the cartoon character Padman. It presents the weapons, game modes and the game world. The article is directly accessible via bild.de. A detailed article by Carola Siedentop about ENTE, the family-friendly computer game World of Padman and the main character Padman. The article can be accessed directly here or via rp-online.de. Courtesy of the editors of Rheinischen Post. 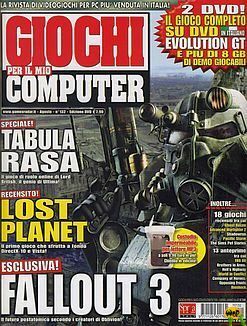 In the Next Level section of this issue of the Italian GMC magazine, World of Padman was touted as a standalone game in a half-page article for download but only received a 3-stars rating. Nevertheless, we were happy. A rather short but very readable article appeared in this issue of our standalone release of World of Padman. It briefly goes into the history of development and all the essential gameplay elements. Also in Poland one is very enthusiastic about World of Padman, or at least we think so after a small article has been dedicated to us there. 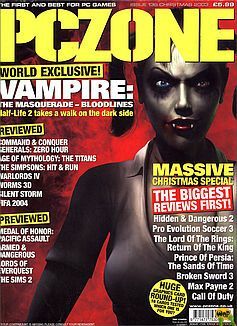 The game was also available in this issue on DVD. World of Padman was featured on this DVD of this issue and was described in a very detailed and inspiring manner on almost one page by Marc Brehme. It also explains the key points to weapons, game modes and gameplay. You can find the article here. The article is quite short and praises World of Padman as “Downloader”. But it goes into the main points and puts the game mode Spray Your Color and the map design in the foreground. World of Padman was featured in this issue on the DVD and was also given a small article. In this, Padman’s fame in Germany is funny compared to that of David Hasselhoff and put on a par. We had a great time. Also in Serbia, a very detailed article by Jovana Erčić was written in the section Svet Igara (World of Games) for the release of World of Padman as a standalone game. The article is directly accessible via the news archive on sk.rs. 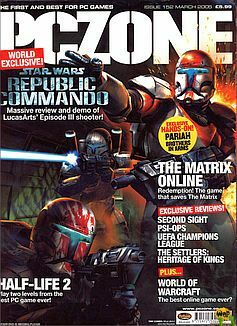 Our game was on the DVD of this issue and was touted there as another highlight. There was only a small introductory article but at least we found mention on the title page. Also in India, one was interested in World of Padman, at least there was our game in this issue on DVD. It was not enough for a real article, but at least it was mentioned that World of Padman is now available as a standalone and Quake 3 Arena is no longer needed to play. With this sentence begins the almost full-page article and we are still not sure if that was meant nicely. In any case, our game is fully described and the game mode Spray Your Color is well highlighted. You can find the article here. 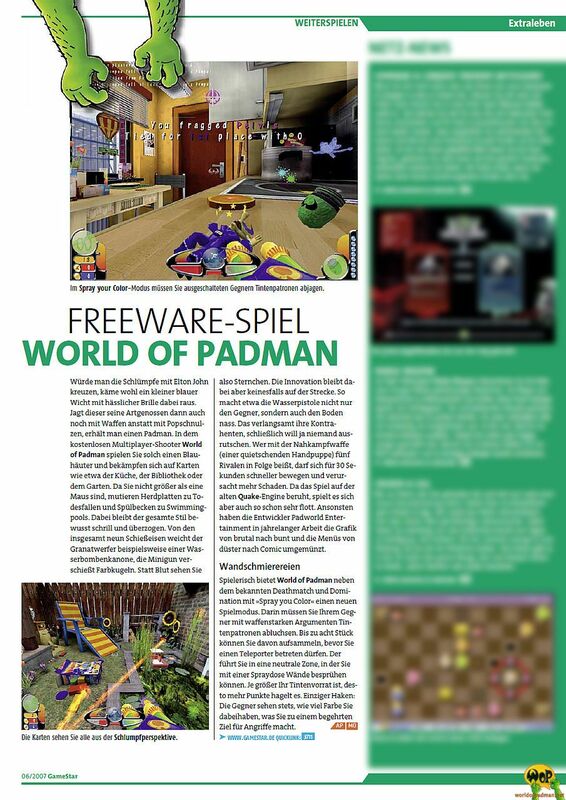 Also in Belgium our game was well received and in this issue there was a quite detailed and richly illustrated article about the World of Padman standalone game. That World of Padman would be a topic in the Stern, we would not have thought. 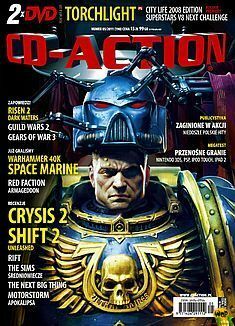 The article by Carsten Scheibe, shortly after the release as a standalone game, gives a good overview of the features of our game. The article is directly accessible via stern.de. 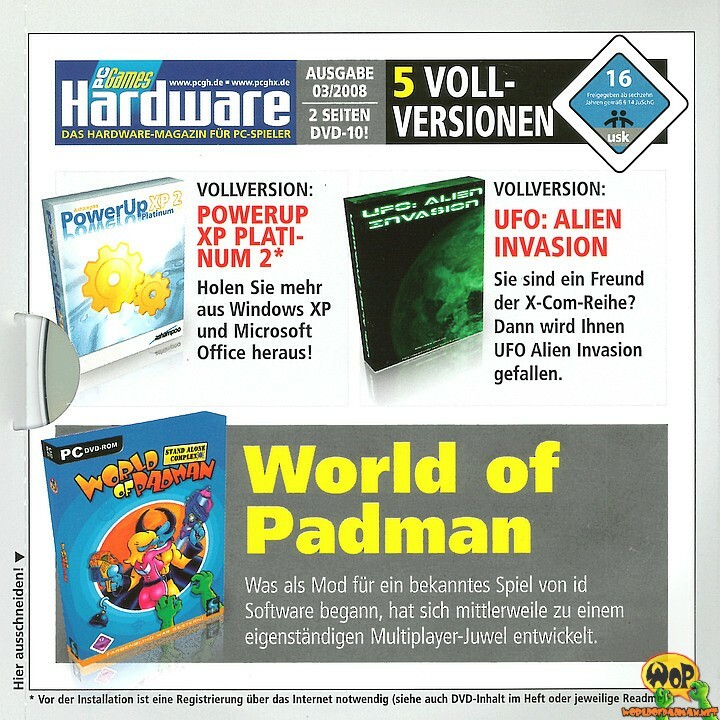 Immediately after the release of World of Padman as a standalone game, doelf published on au-ja.de a very detailed illustrated review. The review is directly accessible via au-ja.de. Shortly after the release of World of Padman as a standalone game, it was presented in great detail on the Giga Games show. In several sections of the show, the menus, gameplay, weapons and game modes Free For All and Big Balloon have been introduced. Timsen and Slick-Rick went to great lengths to tackle the heavy bots, while Susi loosened up the whole show with her funny interjections. A compilation of the show is available on YouTube. 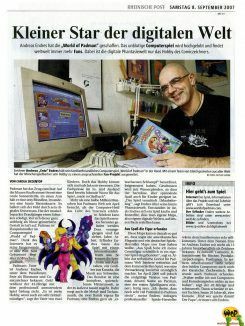 Shortly before the release of World of Padman as a standalone game, Harmonieman was invited to GameOne (Episode 23) on MTV to answer questions about computer game modding. Of course, World of Padman did not miss out on the show and was presented accordingly. A recording of the TV show is available on YouTube. 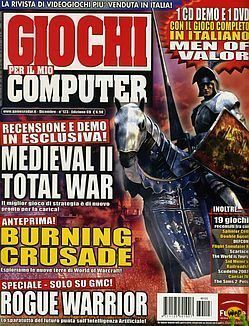 In the section Next Level of this issue of the Italian GMC magazine, World of Padman as a modification for Quake 3 Arena was praised in a half-page article for download and got a clear recommendation with a 4-stars rating. 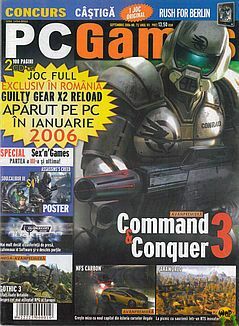 Also in Romania one was interested in World of Padman, because there was our game on the DVD of the issue. Unfortunately, it was not enough for an article, but it only appeared in the list of DVD games. In the TV show Neues on 3sat World of Padman was presented as a modification for Quake 3 Arena in just 30 seconds. Shortly before, Linux-Gamers.Net was present with a stand at the LinuxTag from 3rd to 6th May 2006 in Wiesbaden and presented the competitiveness of Linux for current games and e-sports activities. A recording of the TV show is available on YouTube. Unfortunately, we are missing the article here and therefore do not know to what extent World of Padman was mentioned. 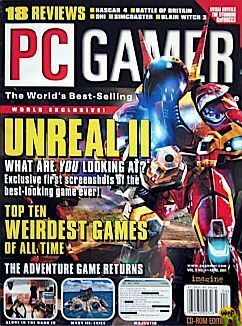 What we know is that World of Padman as a modification for Quake 3 Arena was on the DVD of this issue. 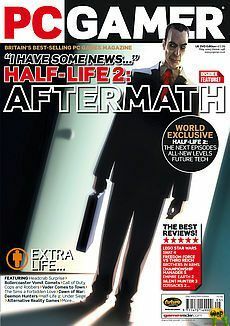 World of Padman was among other mods of the month such as Dice City, Jurassic Park and Damnation on the DVD of this issue and was briefly named in the Extended Play section. In 2004, World of Padman was about to be released as a modification for Quake 3 Arena. At that time, ENTE and the PadMod team provided GIGA Games a beta version of the PadMod. 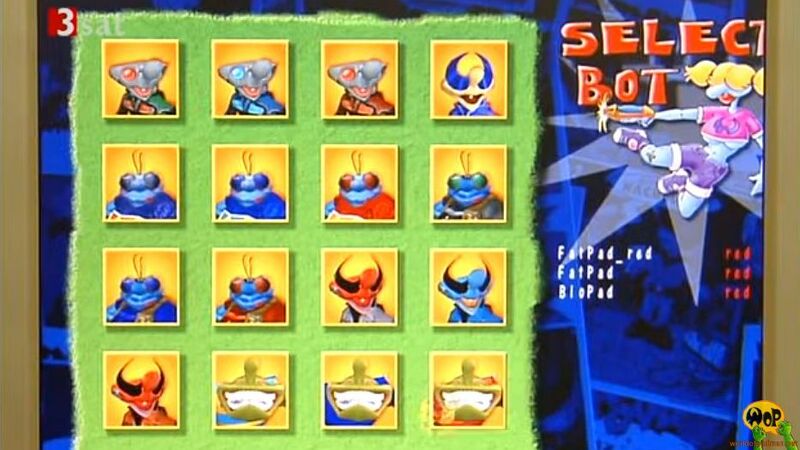 This was then extensively played and presented in the show GIGA Games. A recording of the program is available on YouTube. 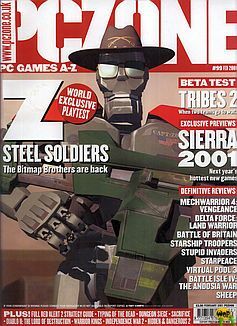 In the Community Chest section of the Christmas issue, Tony Lamb briefly mentioned ENTE (here Padman) and his PadMaps in connection with community content tips for Quake 3 Arena. A very detailed interview from bS’slyght with ENTE about the modification World of Padman for Quake 3 Arena, also known as the PadMod, which at the time was in development. It is about the team behind it, the status of the work, concepts and ideas. 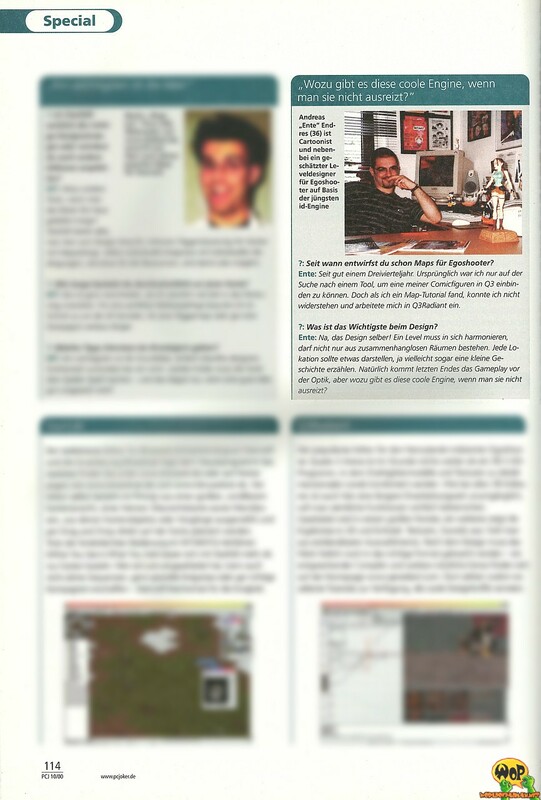 The interview is directly accessible via inquake.de (then planetquake.de). 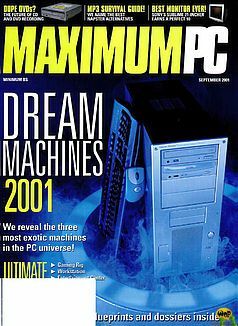 And once again, this issue praised the ENTE’s PadShop based Maximum PC Quake 3 Benchmark, right next to the Dream Maschine Gaming Rig of the year 2001. The benchmark was then also on the CD-ROM of the issue. In the Extended Play section, three of ENTE’s PadMaps for Star Trek: Voyager – Elite Force got featured by Tony Lamb. 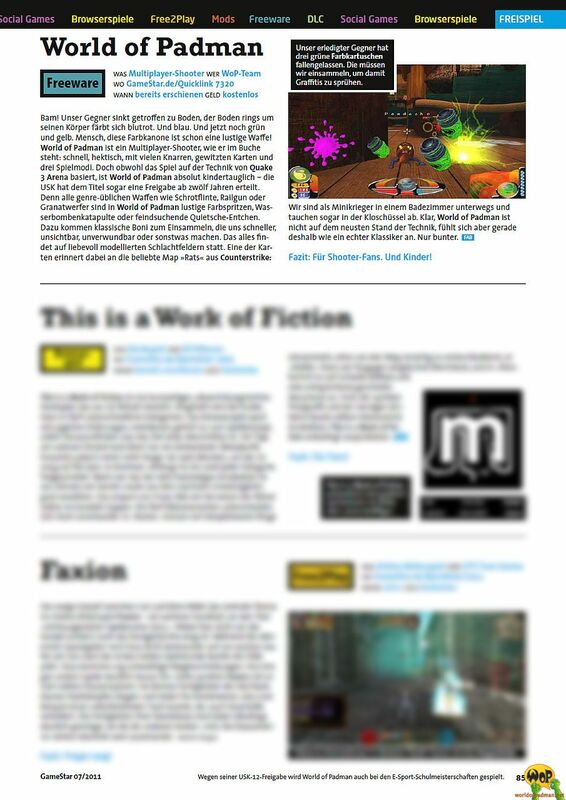 The maps were PadGarden, PadKitchen, and PadCenter, the latter being highlighted as Map of the Month. The maps were consistently rated 4 to 5 stars and were also on the CD-ROM of the issue. 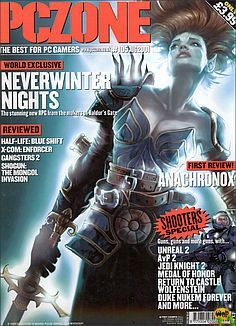 In this issue, a demo of ENTE’s PadShop, which became known through the PC Gamer magazine, was used as benachmark for VisionTek’s Geforce3 graphics card. After all, the card reached an average of 51.4 fps in the so-called Quake 3 MaxPC Demo. 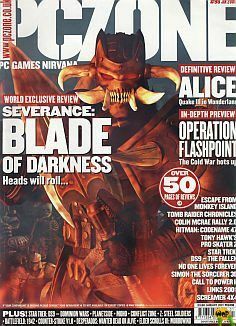 In 2001, ENTE created the map PadShop for Quake 3 Arena for the US magazine PC Gamer. The editors supported him with photos for creating textures and they even got the permission of id to use textures from Doom 2 for a secret in the map. 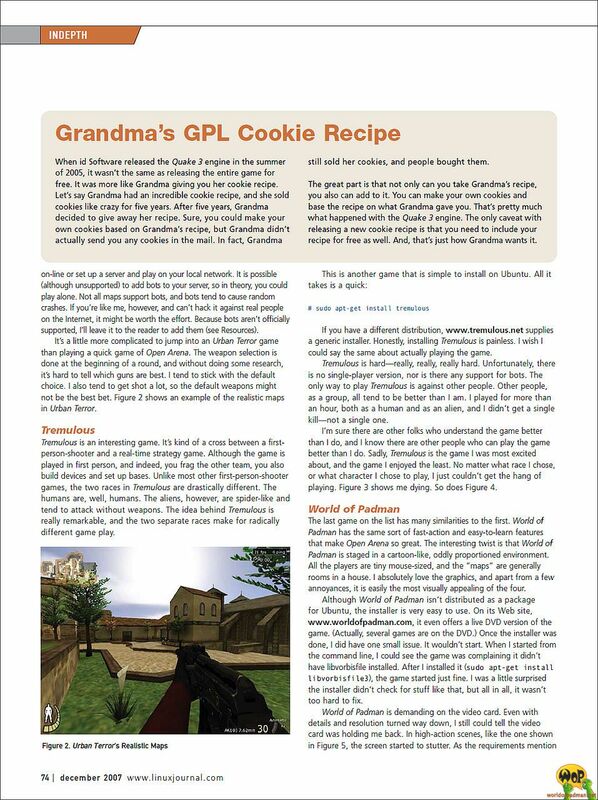 There was a corresponding article and ENTE’s PadShop was also on the CD-ROM of the issue. In the Extended Play section, seven of ENTE’s PadMaps for Quake 3 Arena were compiled and presented on two pages by Tony Lamb. 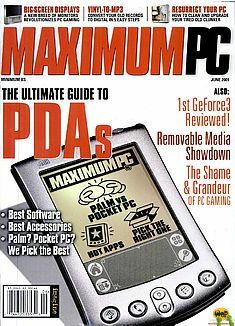 The maps PadGarden, PadKitchen, PadCastle, PadHome, PadCenter, PadPool, and PadSpace were consistently rated 4 to 5 stars and were also on the CD-ROM of the issue. 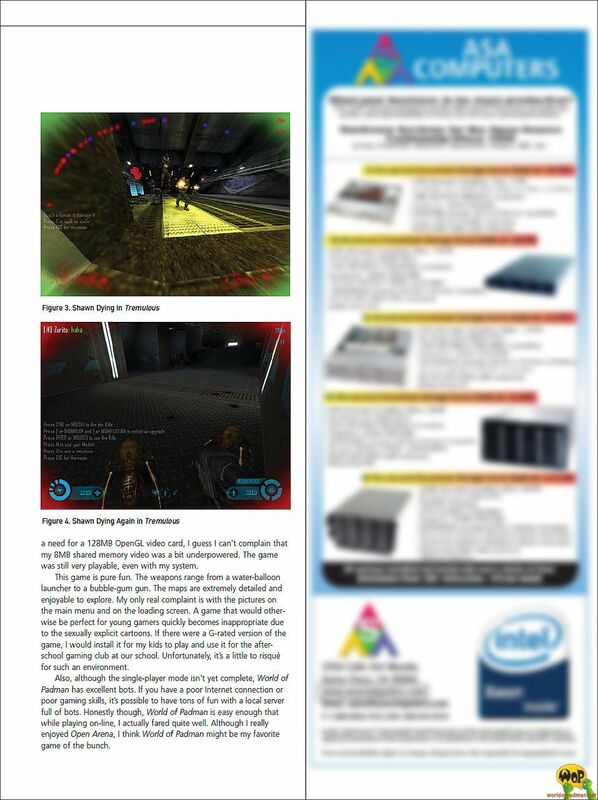 In the Player Forum section, a two-page article by Benjamin Boerner on the game Star Trek: Voyager – Elite Force, the emergence of the community, and maps for the game was released. ENTE’s PadGallery received a small feature and was on the CD-ROM of the issue together with the Padman player model and the Padtrekkies skin pack. You can find the article here. In the Extended Play section, ENTE’s PadGallery for Star Trek: Voyager – Elite Force got a small feature in a two-page article by Tony Lamb. The map received a 5-star rating in the issue and was also on the CD-ROM of the issue. 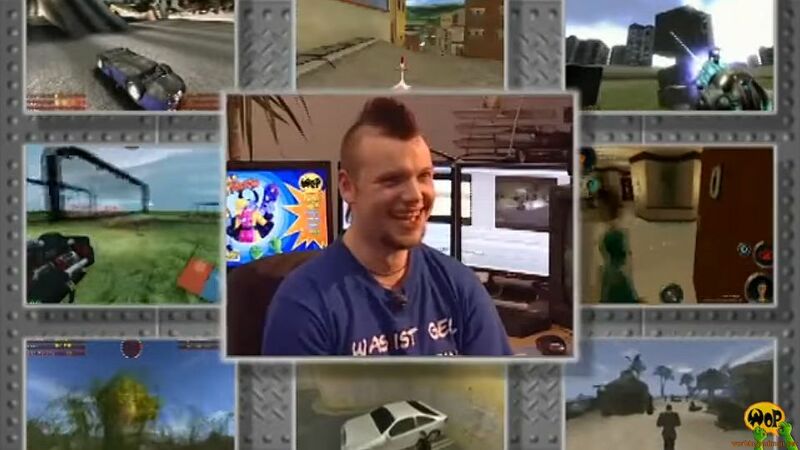 In 2001, ENTE was invited to an interview on the GameOn TV show. It was about level design for Star Trek: Voyager – Elite Force, in which ENTE also presented his PadMaps. A recording of the interview is available on YouTube. 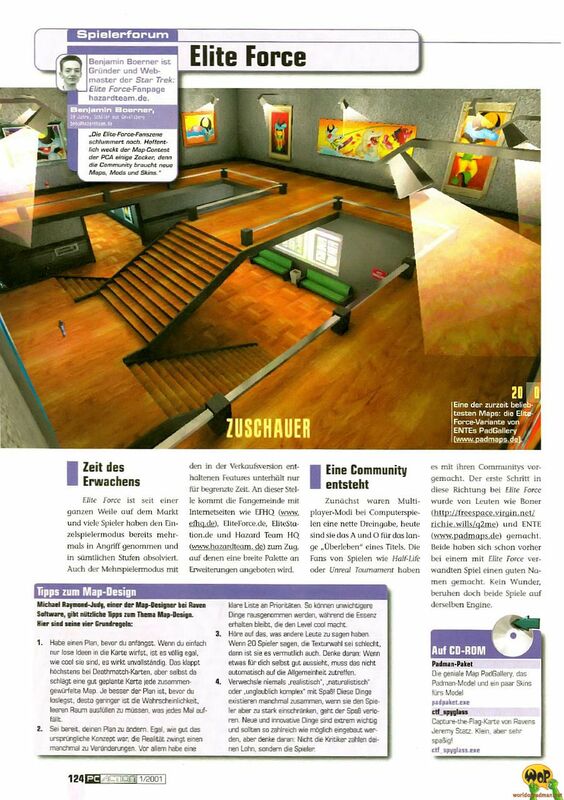 In this issue, there was an interview with ENTE about creating maps for Quake 3 Arena, ideas, and level design. The whole thing was very short but worth mentioning. You can find the interview here. Courtesy of the former editorial board of PC Joker.